The Serra Spray Soap Plus system is an attractive, robust and lockable dispenser, available in two (2) model sizes - 400ml and 800ml. Hermetically sealed contamination free refill liquid soap sachets, available in 400ml and 800ml capacities. The Serra Spray Soap Plus system has been internationally tested and approved, and continues to distinguish itself in varying washroom environments. 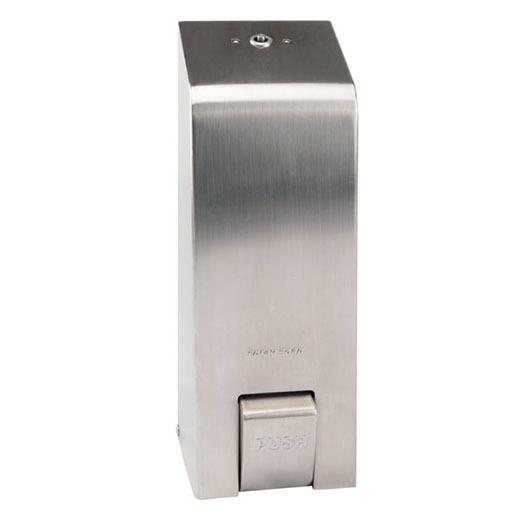 The modern, streamlined Serra Spray Soap Plus dispenser provides an extremely inexpensive and efficient means of dispensing liquid hand soaps. The lockable dispenser - incorporates the unique automatic Serra Snaplock locking system - vandal resistant with universal Serra Barrel key. This feature serves as a deterrent for soap theft. Thus, reducing pilferage and protecting the investment (i.e., money) spend on the dispenser. The totally reliable pumping mechanism is specially designed to avoid repair and service costs, i.e., it is maintenance free, more importantly it has been developed to eliminate leaking and other common faults of traditional dispensing systems. This has been achieved through the use of the Serra Atomizing Pump Mechanism and Serra Snap-seal refill sachet.